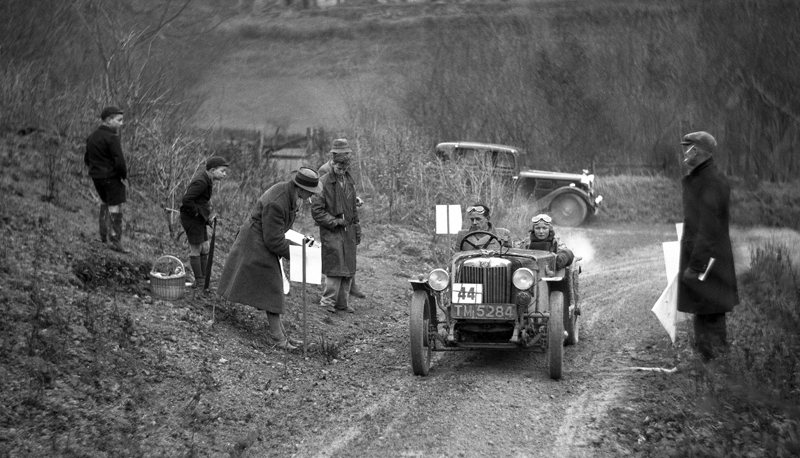 This 1929 Bedfordshire registered MG Midget (TM 5284) is seen here competing in the (7th) December 1935 running of the MCC London-Gloucester Trial with L. Onslow-Bartlett at the wheel. At some point after June 1932 the car had been fitted with a McEvoy body (source Cowbourne) although this head-on view doesn’t permit many of the differences with the standard example to be seen. What the image does reveal is that the front wings are home-made cycle types while the front dumb-iron valance has been removed and the slatted radiator surround is another non-standard addition. The MCC awarded this car/driver combination a third class award upon completion of the trial. This image is located in the Motor Sport archive and is reproduced here courtesy of LAT Photographic.